This item is currently on backorder. Orders containing this item will ship as soon as we have the 500 ml CarPro Essence Plus in stock. Estimated ship date: 4/26/19. Check out the 250 ml and 1000 ml that are in stock right now. Repair and restore your coating! The CarPro Essence Plus is a non-abrasive solution that will help you repair fine swirls in a damaged ceramic coating, while simultaneously increasing gloss, hydrophobic properties, and cleansing the surface beneath! I am sorry for the mouthful in that first sentence, but there is just no short way to describe this awesome product! In the past, if you had swirls, scratches, water marks, or simply did not take care of your coating, your only option was to remove it and re-coat the car to get it back to looking it's best. With Essence Plus, you can now repair and restore the coating without having to remove whatever coating may be left on the surface. The unique formula is the key and it is packed with SiO2, ceramic coat repair agents, high gloss quartz resins, and hydrophobic nano particles. For the exact application instructions, take a look at the CarPro suggested steps below. After application, you will be amazed at the smooth, glass feel and gloss left behind. Your paint will really pop and your coating will be rejuvenated, extending the protection and durability of up to a year, if not more! If you do not have a coating already applied, Essence Plus will not correct the paint, but it will help add some gloss and protection to the surface. As you can already tell, Essence Plus is a completely new concept and CarPro does not want you to mix it up with the already popular Essence. 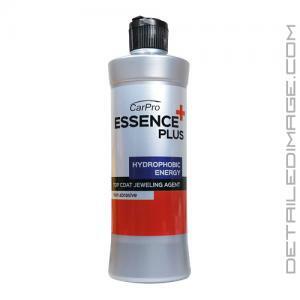 Grab yourself a bottle of CarPro Essence Plus and rejuvenate your coating! Wash, decontaminate and rinse thoroughly. Without pressure, apply in overlapping figure eight motions across 24" sq. ~ 36" sq. (60cm x 60cm ~ 90cm x 90cm) section. Wash with Reset, and decontaminate with Iron X, Spotless, and Tar X as needed. Dry Vehicle and wipe down with CarPro Eraser for clean oil free surface. Apply 4 Pea size drops to CarPro Gloss Pad mounted on dual action polisher. Use with no pressure and on low speed across 60x60cm/24"x24" section. Wipe off immediately with BOA towel. Apply ESSENCE+ to a soft foam applicator work in circular motion all over the surface. Dries to a haze within minutes & wipe off immediately after. Purchased to help my Quartz coating on the Trans Am I did 1 year ago, it definitely added slickness to the surface and is very hydrophobic . All in all I'd say I will definitely purchase this product again for other projects. 2 thumbs up for this stuff. This is a excellent product! Its a lifesaver if you ever have any high spots when applying coatings. Very easy to apply and works great for coatings, sealants and waxes. I highly recommend this product in your arsenal. Great for cars that are too thin to safely correct. Or for customers to safely bring the pop back up in their ride. Very quick to apply by da, around an hour for a vehicle. Nice half way step between wash and aio. You folks at Detailed Image are awesome. I love the products and the support.